Your indoor tennis court season can start as early as the week of September 10th. Monday Hours: 10:00 am to 3:00 pm; Season ends the week of April 26th. Tuesday – Friday Hours: 9:00 am to 3:00 pm; Season ends the week of April 26th. Saturday Hours: 8:00 am to 1:00 pm; Season ends Feb 23rd. Sunday Hours: NEW! 8:00 am to 8:00 pm; Season ends Feb 24th. 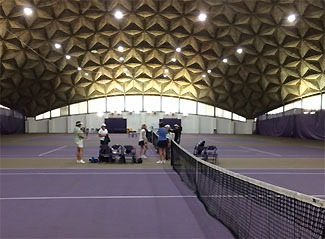 Through a partnership between Elmira College and GETA, indoor tennis is available at the Murray Athletic Center (MAC) on Route 14 in the town of Veteran. There are 4 hard courts with new LED lights. Known dates from the college when either no tennis or tennis must be completed by 12:00 pm or 2:00 pm. The changes below in blue show dates when the college has a competition with another college. The use of the word “possibly” per the college is that if the competition goes longer than expected, someone showing up at 6:00 pm to play may have to wait until the match is over. NEW – Indoor Membership Fee: All the actions necessary by GETA for indoor tennis have required hundreds of hours each season by John Renz. John was unwilling to donate this amount of time again. The GETA board determined if John was willing to continue, the board would compensate him for his time in 2018/2019. To gain the funds necessary, the GETA board approved a seasonal Indoor Membership Fee of $40 per person; it allows the individual to play in as many sessions as desired. There is no family membership. In comparison, the membership fees at the Reis Center in Ithaca are $235 per individual and $330 per family. Both the GETA Membership and Indoor Membership fees can be paid online or by sending a check to GETA’s PO Box mailing address. If a group wants to make-up for a cancelled session, it can Book a Court online for the same cost as the refund! (See the menu item Book a Court under Indoor Tennis). NEW – Communication: To also reduce John’s time, he will maximize the use of the GETA website to communicate to captains who in turn should also save time in communicating with their team members. As done last year, each captain will get a worksheet from John Renz to calculate the seasonal costs both for each group and each member based upon the number of dates the group & member will play. Sessions are 90 minutes. If additional time is of interest, contact John Renz at his email address above. NEW: The GETA website has a “bulletin board” feature. This free bulletin board is a tool to help GETA members meet new players, find a sub or regular for an existing group, or start a new group. Bad weather can become a frustrating problem when players are uncertain if there is tennis. The college will inform the GETA rep or his designee as soon as possible on any closings of the MAC or delays in its opening. GETA will then post these closings/delays on its home page (Announcements section). Please use your judgment in deciding whether or not to travel when the road conditions are potentially dangerous. The college says it cannot risk opening up the locker rooms to us where players leave personal belongings. They will provide 2 chairs in each bathroom for dressing.